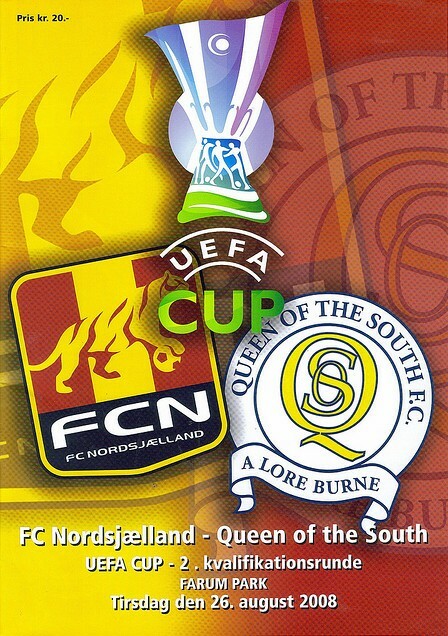 Congratulations from all at Queen of the South FC go to former opponents from the 2008/09 UEFA cup campaign, FC Nordsjælland. FCN as the club name is usually abbreviated to, are the 2011/12 Danish league champions. Like Queens, FCN were formed through a merger. The club`s rise in the two decades since has been impressive but not without controversy and indeed tragedy. The merger took place in 1991 when two clubs from Farum, a town on the edge of the Copenhagen conurbation sprawl, joined together. Thus Farum Idræts Klub and Stavnsholt Boldklub became Farum Boldklub and joined one of the divisions at the fourth tier of the Danish football league system. Their debut season was a success finishing second to earn promotion to the Eastern division of Denmark’s third football level. 1998 brought a further promotion and the club turned professional to mark joining Denmark’s second tier. 2002 was the season Farum BK joined the Danish top flight, the Superliga. On the field in their first top tier season the club finished third achieving their first qualification for a UEFA competition. There was however trouble afoot for the club. The results on the pitch were over shadowed by off field events. The mayor of Farum had been a strong supporter of the club helping in its formation. A financial scandal broke out when it came to light that overpayments were being made to supplier organisations to the municipality who in turn would then sponsor FCN. The mayor was forced to step down as chairman of the club with the club’s existence at threat. To distance from the mayoral financial scandal the new owner renamed the club. The new name was chosen to represent the region in Denmark rather than just the town of Farum. 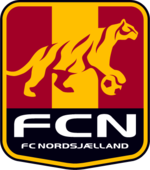 Thus the name F. C. Nordsjælland was born. A stroke of genius was made to accompany this. A network of over 50 amateur clubs in the region were brought together to form the Football Cooperation of Nordsjælland (abbreviated in Danish to FSN). The objective of the cooperation is to identify and highlight young local footballing talent to be nurtured and developed with the intention of players reaching international level. Thus despite Denmark’s big guns of Brondby and F.C. Copenhagen being on the doorstep, around the Nordsjælland region at least the FCN scouting network is superb. The amateur clubs enjoy in return from FCN coaching visits, workshops and training camps, players on loan moves, friendly games, match tickets and merchandise. The maiden UEFA Cup appearance brought a qualification round win of 6-0 on aggregate over Shirak FC from Armenia. In the first round proper they were eliminated by Athens club Panionios. Their next appearance in the UEFA Cup was courtesy of the fair play charts. Now defunct Estonians TVMK Tallinn were beaten soundly home and away. Then came the two August games in the next round that led to FCN being mentioned on this website now. The first leg between Queen of the South and FCN was a landmark event in QoS history. The debut appearance in UEFA competition was Queens playing at a level few fans would realistically have expected to witness, even less so such dreaming when sober. That first game though was largely forgettable for Queens fans. As Andy Aitken accurately said when giving his recollections, if the game had been a domestic fixture then it would have been called off. With the away team having travelled internationally though, the game went ahead with the pitch resembling The Everglades. FCN scored in the first minute to immediately give them the advantage. Although Queens hit back with a header from Sean O’Connor, FCN scored a second to return home firmly in the driving seat. What followed though were the events that the Queens fans who were there will cherish for as long as they have breath in their lungs. The feel good factor started before the second leg started. Queens fans have endured plenty suffering over the decades and need no encouragement to appreciate that a trip overseas to watch their team in UEFA competition, these kind of events don’t fall out of trees. Thus the Doonhamer hoards set off with a resolute determination to relish a special moment. Then the first indication of the kind of people to be encountered in Denmark was experienced. A few days before the game FCN passed the message across that for the journey from central Copenhagen 25 km away to Farum, they would be laying on a flotilla of courtesy buses from the square outside Copenhagen town hall. Nice touch. And so to the second leg itself. The game kicked off in blazing evening sunshine in an excellent 10 000 all seater stadium - crowd close to the pitch with no track and with the corners filled in (Almondvale in Livingston is a decent comparison). The game had just kicked off when the evening sunshine was to play its part. Queens fans were stationed in the stand behind the FCN goalkeeper in the first half. With the beaming sun setting in the cloudless sky, it seemed the obvious question to wonder if the Danish keeper was having vision issues staring straight into sun in the way the fans behind him were. Queens were awarded a free kick in the first minute from around 25 yards out. The ball was teed up for Bob Harris who thumped the ball towards the middle of the goal. What would in different circumstances have been a routine save, the keeper initially went the wrong way before being too late to readjust himself sufficiently in his efforts to keep the zinging ball out. One nil to Queens and it was back to being all to play for. Queens were excellent in that first half, dominating the game and missing a real gem of a chance to lead in the tie. The Danes improved in the second half before the injection of Stephen Dobbie. Including the first leg, QoS Manager, Gordon Chisholm, had been persevering with Stewart Kean seemingly as if to make a point to Dobbie – the most talented striker in the division at the time by the length of the M74. Kean though offered hard work to accompany some pace that he had. Chisholm’s selection of Kean seems to have been some sort of an attempt to motivate Dobbie into upping his work rate. On his introduction to proceedings Dobbie obliged by showing what he offered in contrast; superb instinctive ball control, touch, vision, imagination and only failed to provide the one part of his game for which he is best associated – goals. Dobbie’s late introduction almost brought Queens the goal that would have put them ahead on aggregate. With the seconds ticking down and nothing to lose from being behind on away goals, Queens resorted to a near suicidal formation in the closing minutes. FCN were happy to take advantage and Martin Bernberg scored two goals in the closing minutes. The game ended 2-1 with the score line unreflective of the supremacy of Queens play in the second leg with FCN coach, Morten Wieghorst, among those to commend Queens performance in the second leg. While the players of FCN had finished for the evening, the hospitality of the Danish club was by no means over. Talk about how to make a good impression? The same flotilla of courtesy buses was lined up outside the ground for the return to CPH, but this time with accompanying food and drink awaiting the visiting Scots fans – the icing on the cake in a supreme PR master class from the magnificent Danish hosts. So onwards for the QoS fans to enjoy the Summer evening fun of the Danish capital and contemplating that while their team may be out, they at least went down fighting and with heads justifiably held high. There was also the additional satisfaction of the superlatives awaiting them in the press the next day on their excellent fan behaviour as ambassadors for Queens, Dumfries and Scotland. 2008 was the zenith of the Blount, Bradford and Rae revival for Queens and things since could obviously have gone a lot better than the relegation season just past. FCN’s fortunes have continued on the up but not without an event that puts the real context of football into reality. The world game, the beautiful game, the people’s game, undoubtedly, but some things occasionally remind us that in the big picture it’s just a bunch of people running round after a ball. Jonathan Richter, one of twin brothers who played for FCN against Queens, on 20th July 2009 was struck by lightning causing cardiac arrest during a game in Copenhagen. Richter was medically induced into a coma as per standard Danish cardiac arrest treatment. Richter survived the ordeal but at the expense of the amputation of his lower left leg. Ex QoS Ted McMinn has endured a similar battle to come back from such a serious medical procedure as amputation. Richter’s case is all the more tragic in that unlike McMinn, Richter at the time was a young man of 24 who otherwise had his best footballing years ahead of him. FCN have retired Richter’s squad number, 26. After eliminating Queens, FCN played Greek opposition in the next round but lost heavily, similarly to as they had seasons before, this time to Olympiacos. 2009/10 brought FCN their first national silverware when they won the Danish Cup. In the final they beat FC Midtjylland after extra time. A newcomer among that season’s playing staff was a continuation of Denmark’s most famous footballing family, Andreas Laudrup - son of Michael, nephew of Brian and grandson of Finn. In a Groundhog Day 12 months later FCN again lifted the Danish cup with another extra time win against Midtjylland. The Groundhog didn’t stop there as on both occasions the cup win took them into the Europa League. On both occasions they were knocked out by Sporting Lisbon. Wieghorst left in 2011 to take over the Danish under 21 side having presided over what was then the most successful spell in the club’s short history. The club promoted from within with Kasper Hjulmand becoming Head Coach. Hjulmand’s reign started well with FCN’s good form recognised with five call ups to the Danish squad for the Autumn internationals. It was another manager who made the headlines though in January. Roland Nilsson, Sweden right back from the 1990 World Cup Finals game against Scotland and ex FA Cup Finalist with Sheffield Wednesday, was in his first season as Manager of FC Copenhagen. His side were top of the league in January when he was sacked. Their subsequent overtaking by FCN is only the fourth time in the last 12 years the heavyweight club of 21st century Danish football haven’t lifted the title. With Denmark having moved up the UEFA coefficient rankings from 15th to 12th, as Superliga champions FCN are awarded direct entry to the 2012/13 Champions League group stages. This is rather than competing in the qualification rounds. Best wishes FCN for the future and the Champions League campaign. Best wishes also to Jonathan Richter.